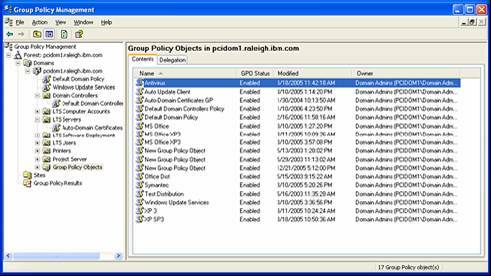 In the Group Policy Object Editor, the administrator sees hundreds of policies that can be changed. 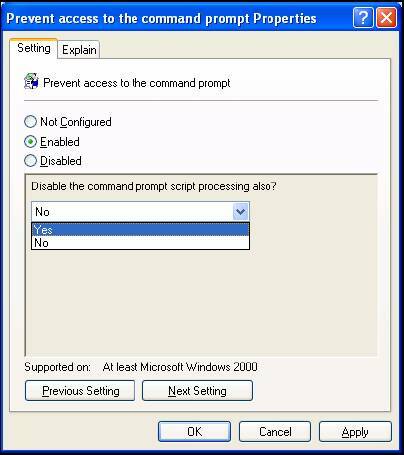 For example, a policy may allow a user to (or not too) access the command prompt. 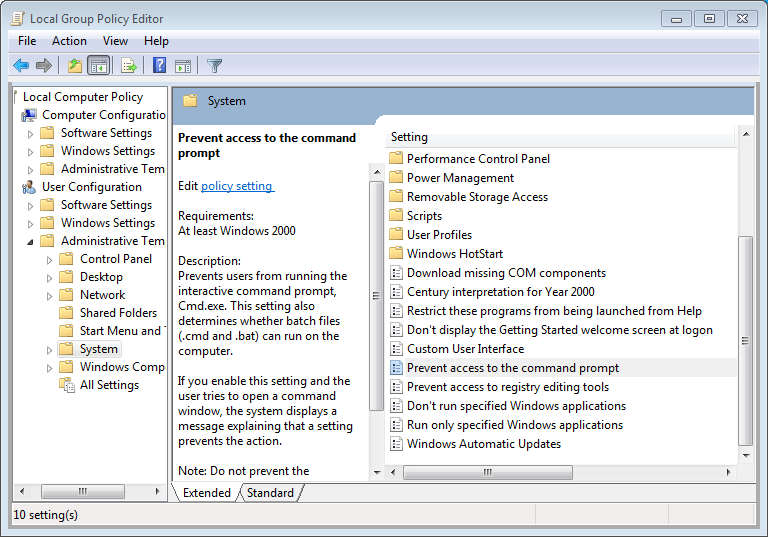 Since group policies effectively edit the registry for computers and users, anything that is stored as registry key can be modified and changed through a Group Policy. You can do this by creating a custom ADM file. You edit most policy settings by double-clicking the title of the policy setting, which opens a dialog box that provides specific options. In most cases, when you can double click the title of a policy setting, the dialog box contains any relevant defining information about the policy setting. Not Configured: Specifies that no change is made to the registry for this setting. Enabled: Updates the registry with the GPO policy settings. Disabled: Removes the specific GPO policy settings from the registry. Computer Configuration, which holds settings that are applied to computers (At startup and periodic background refresh). User Configuration, which holds settings that are applied to users (At login and periodic background refresh) and these sections are further divided into the different types of policies that can be set, such as Software Settings, Windows Settings and Administrative Templates. 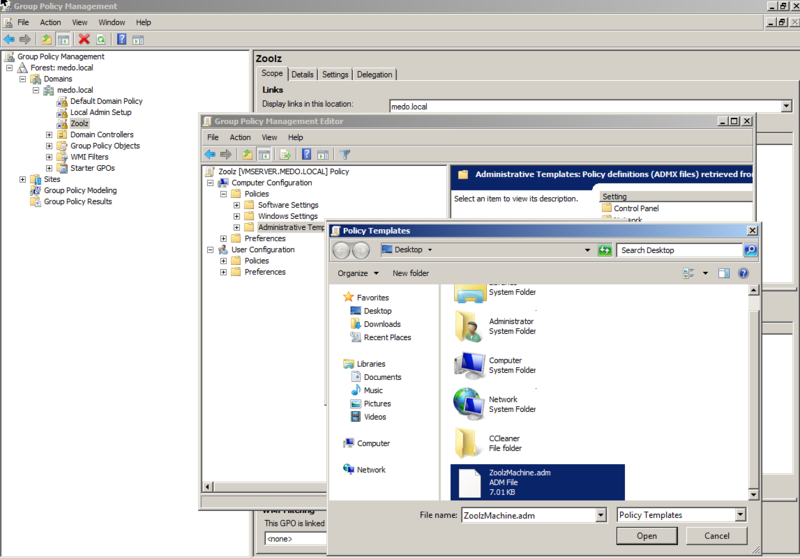 Group Policy Object Editor administrative tool gets installed when Windows 2003-2012 Active Directory is installed. It can be launched from Group Policy Management Console. It can be launched from Active Directory Management tools. The GPMC lets administrators manage Group Policy for multiple domains and sites within one or more forests, all in a simplified user interface (UI) with drag-and-drop support. Supports backup, restore, import, copy, and reporting of Group Policy Objects (GPOs). 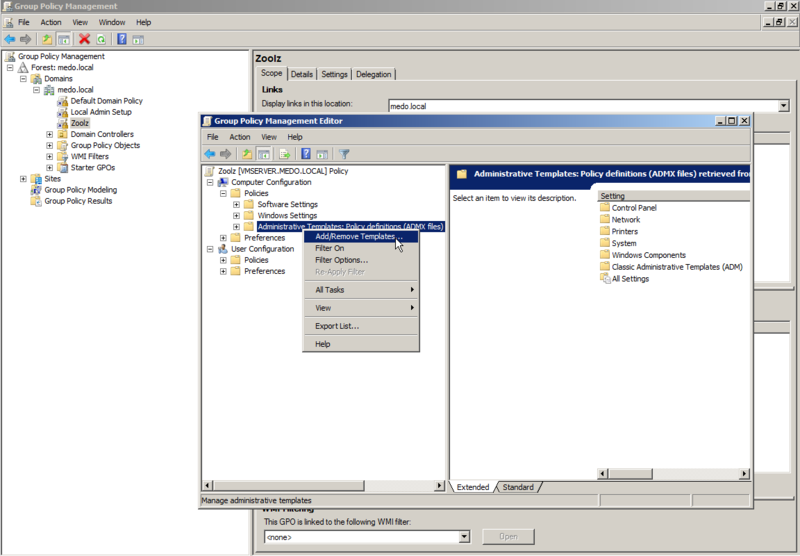 ADM (Administrative Template files) are used to populate user interface settings in the Group Policy Object Editor, enabling administrators to manage registry-based policy settings. Are available directly from Microsoft for Microsoft OS and Application policy settings. Can be created by an administrator. In the GPO editor, right-click on Administrative Templates and Select Add/Remove Templates. Select Add to add a template. Browse through the directory that contains the ADM file and select OK.
Group Policies are not immediately refreshed when changes are made. Windows XP, Vista, 7, 8 computers in domain environment update by default every 90 minutes. 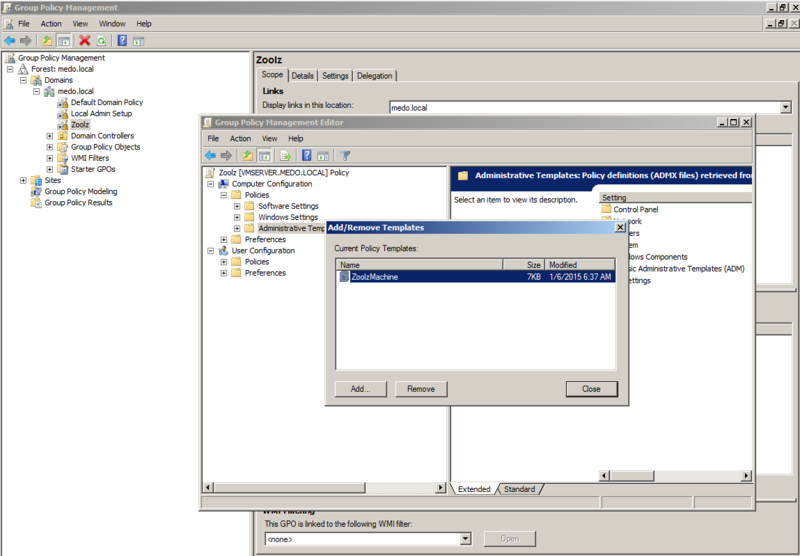 Local Group Policy changes take place from 0 – 5 minutes. Deployment Token: A unique identifier available in the administrator console. To retrieve it, go to Users tab → Install → Centralized Deployment. Active Directory: Read email from the Active Directory. If not available, auto generate sign up email as “username@domain”. Manually Specified: Set a sign in email. You must disable Auto Generate Password. Set it to Enable if you wish the program to auto generate the password which you can reset later on. Set to Disable if you wish to specify a password for all users. Password Token: Set the password token. If you are using an existing user email, supply the password generator with the password associated to the account. Instant Storage Limit (GB): Instant storage limit assigned in GB, if empty then there is no limit. Cold Storage Limit (GB): Cold storage limit assigned in GB, if empty then there is no limit. Policy Name: Assign a Policy; case sensitive, must be entered as it was created in the policies tab. If empty, the user will set up the backup (user defined). If the Account already has a policy assigned to it, this will be ignored. Then under the specific product and GPO item you are configuring. Right-click the product branch in the registry and select Export. Type the registration file name you want to save it as and click Save. Importing .reg files is only required for machines that are not part of a domain. You can manually import it into the registry by double-clicking on the registration file.